While the build-up is rather tedious in some ways, the film’s second half – with its non-stop action and enjoyable stop-motion effects by the old master Ray Harryhausen – is rather entertaining. 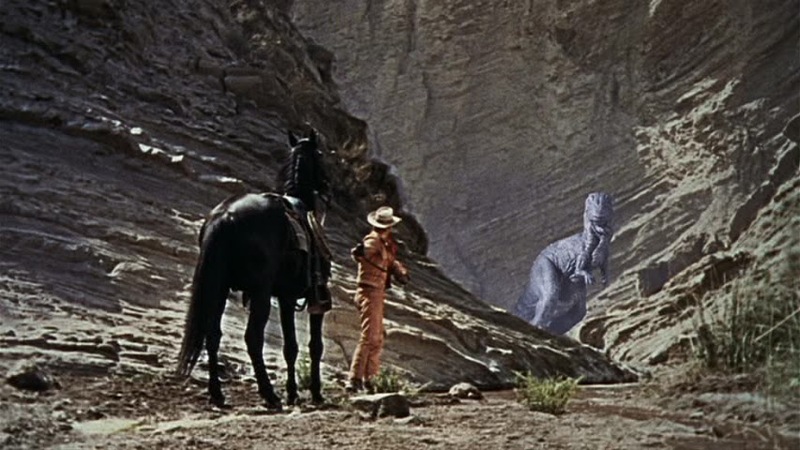 Looking at The Valley Of Gwangi from a modern viewpoint one could easily find unintended hilarity in its primitive visual trickery. But there is something very likable about the film that discourages us from laughing at its datedness. Harryhausen was a genius when it came to creating fake-monsters-with-personality…. and he certainly delivers the goods here. His creations include a miniature horse, a pterodactyl, and various dinosaurs (among them the titular Allosaurus “Gwangi”). The screenplay is obviously a marriage between King Kong and Conan Doyle’s Lost World. Travelling businessman Tuck (James Franciscus) arrives in a border town in the Wild West. He visits the circus troupe that he was once associated with and reunites with his ex-lover TJ (Gila Golan), much to the chagrin of her elderly protector Champ (Richard Carlson). Tuck has learned that the circus is close to financial ruin and thinks he might be able to make TJ an offer she can’t refuse…. but she is so angry about the way he walked out on her months previously that she turns him down flat. Later Tuck discovers that the circus has acquired a new act that might revive its fortunes – a miniature horse discovered in a nearby region known as the Forbidden Valley. Tuck tells a palaeontologist, Professor Bromley (Laurence Naismith), about the horse. Bromley is thrilled when he sees it, and suspects it is some sort of prehistoric creature long believed to be dead. A complex series of events lead the circus staff, Tuck and Bromley into the Forbidden Valley, where they stumble across a whole gallery of prehistoric monsters. The most intimidating of them all is Gwangi – a huge Allosaurus which they capture and take back as a sure-fire circus attraction. Needless to say, there’s just no way the mighty Gwangi will stay quietly in his cage…he’s read the contract and is not impressed. Various aspects of the film gel quite well. 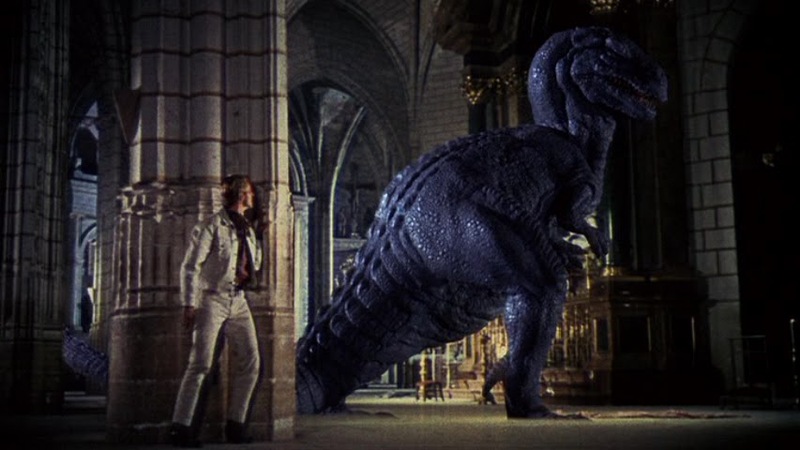 Harryhausen’s trick effects have been mentioned already but there’s also the catchy score by Jerome Moross, Naismith’s exhuberantly enjoyable performance, and the memorable climax in which Gwangi flattens the border town before smashing his way into a half-built church. Other aspects don’t have quite the desired effect – the non-performance of Gila Golan (she sounds dubbed) as the film’s leading female, and the film’s slow opening 45 minute stretch. Plus James Franciscus can’t act very well, but it is fun watching him try harder and harder to little effect. 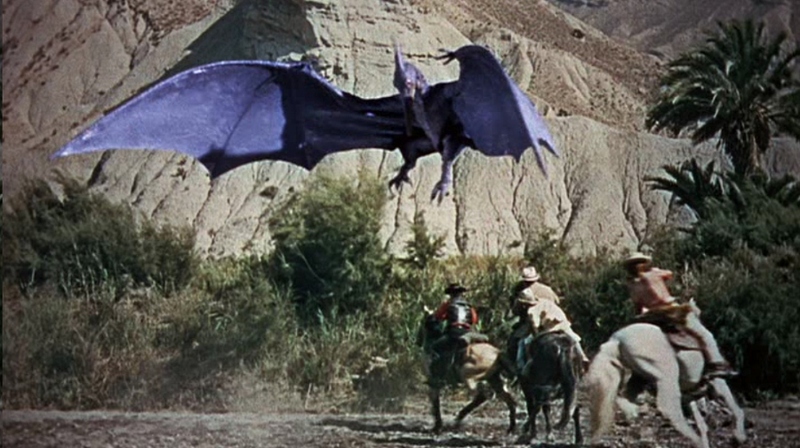 The Valley Of Gwangi is a likable fantasy-western, full of nostalgic value for big kids who remember it and quite enjoyable for new audiences that are discovering it for the first time on dvd. But it is pleasant fare all the same – a guilty pleasure from a bygone era. Thanks! That’s an interesting view. For a dinosaur it is easy to feel sorry for him.